Perhaps it's so hot where you are right now you're wishing for snow or maybe it IS winter and the timing of this post is perfectly appropriate. 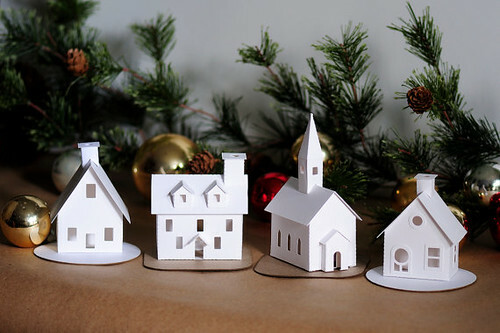 Either way, I hope you'll enjoy all the tips that Carol Fisher of Chicago has to share about decorating paperboard tiny houses. 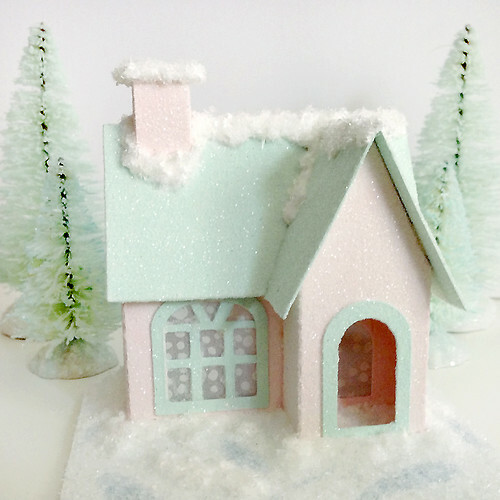 She designs a variety of super-cute kits for Etsy shop Holiday Spirits. Frankly, it's never too early to start thinking about... you know... that holiday. I dare not mention the C-word since it is only August, but like Boy Scouts, we will be prepared! 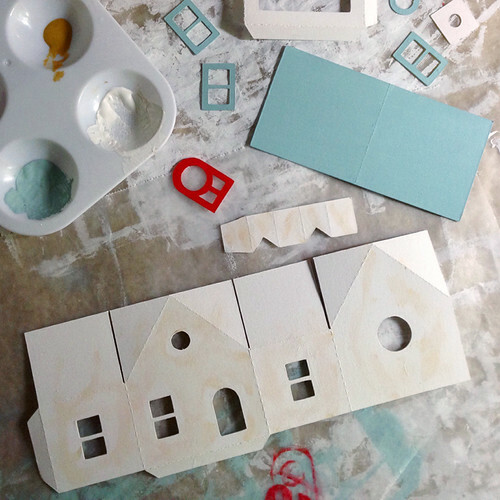 Bright white Bristol board houses look adorable on their own, but dress them up with a coat of paint and glistening snow and they'll become even sweeter. Having ordered one of Carol's beautifully packaged kits, I can tell you it was just like opening a present. 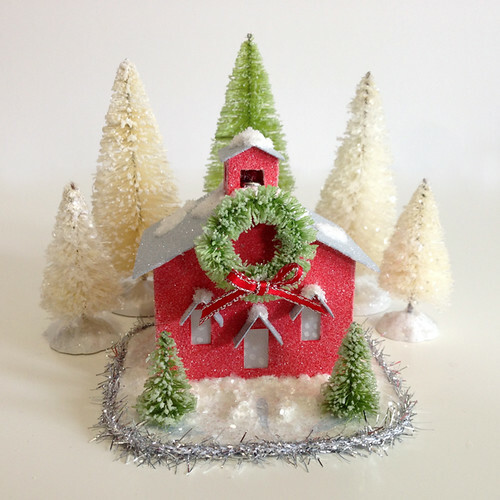 Inside you'll find pre-scored buildings, hand-glittered bottle brush trees, sisal wreaths, dotted vellum, silver tinsel and ribbon along with directions for assembling and decorating. 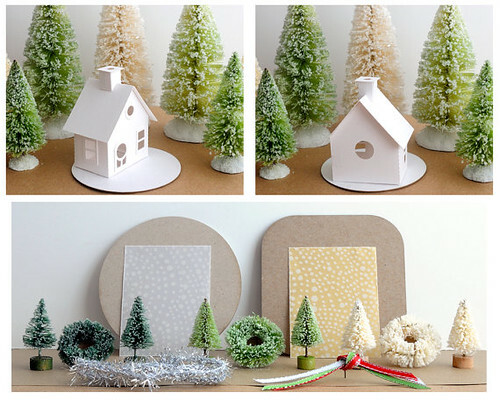 Keep in mind though, that the following snow and glitter directions can be applied to any paperboard house you might have. This is an example of painted components that will be assembled before snow and glitter are added. 1. Put a heaping tablespoon of Snow Tex in a small container. 2. 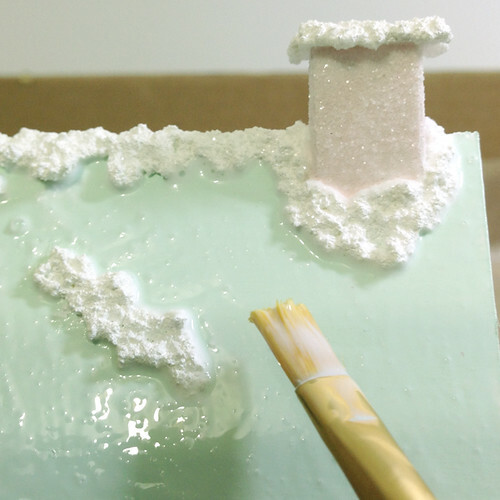 Use a flat paintbrush to place dabs of snow around the chimney top. 3. 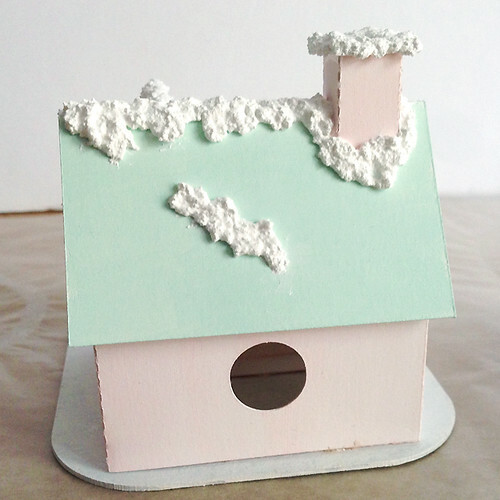 Use a small round paintbrush to push and move the snow, covering the chimney top. 4. Add more snow as necessary. 5. 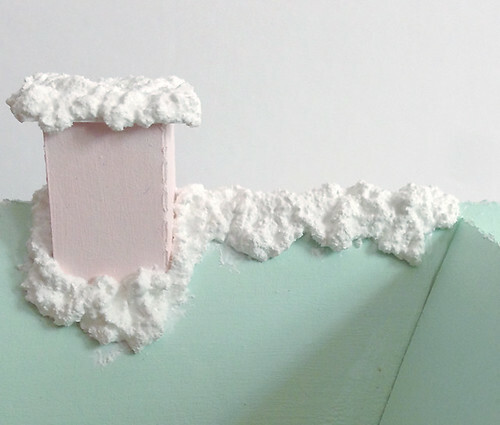 Push small drifts over the edges of the chimney top to cover and create drips. 6. 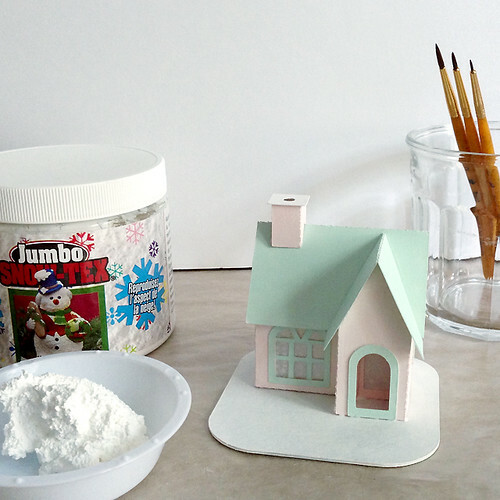 Use a round paintbrush to apply dabs of snow around the sides and bottom of the chimney. 7. Use the point of a small round brush to move the snow into drifts. 8. 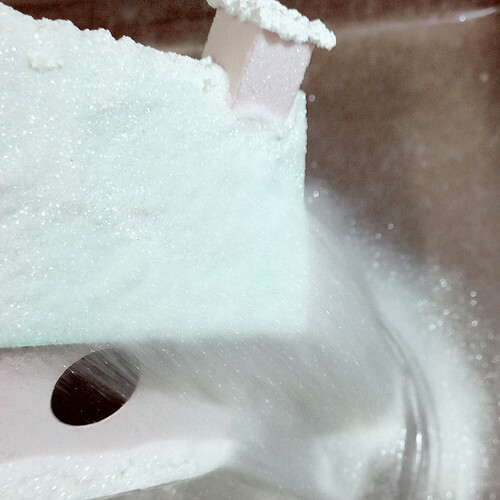 Continue applying dabs of snow across the roof peak, using the round brush to form drifts of snow all the way across. 9. Be sure to make drifts on both the front and back side of your roof. 10. Add a couple snowdrifts across the lower open roof areas for fun! 11. 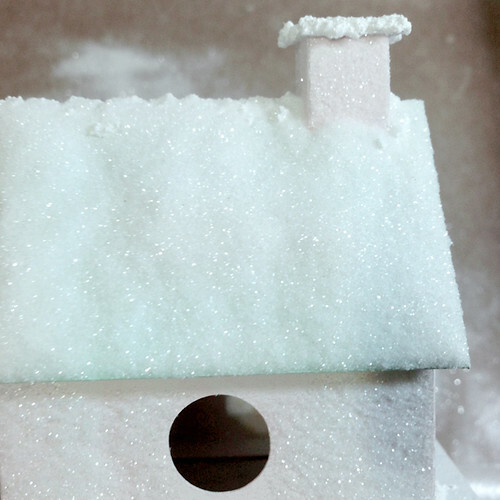 Use the same process to add snow around the house and create a snowy landscape in the yard. 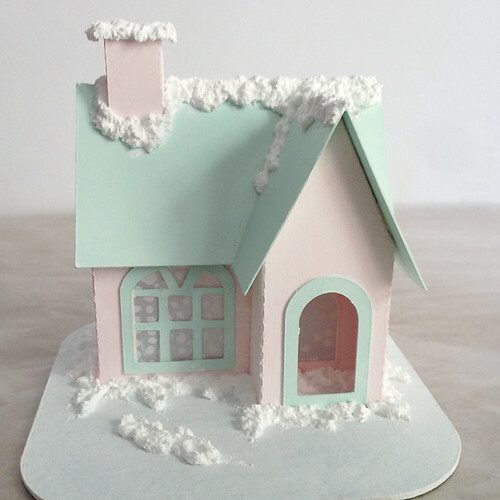 These extra little snowdrifts create a more 3-D look to the ornament base. Think about where you want to place your bottle brush trees so they don’t cover up the snowdrifts. Let the house dry 6 hours to overnight…and you’re ready to glitter! 1. In a small baby food size container, dilute 2-3 tablespoons of Tacky Glue with enough water to thin the Tacky Glue to an icing glaze consistency that will be easily spreadable, but not runny. 2. Get your wax paper-lined box and ultrafine glitter ready. You’re going to glitter the painted surfaces of the house first. The Chimney is a perfect starting place because it is small and easy to cover. 1. 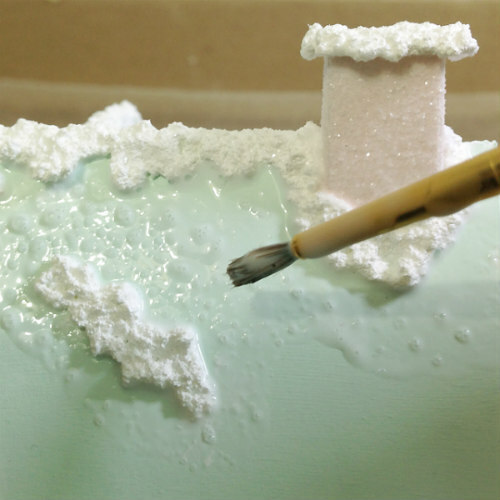 Use the pointed tip of a small round paintbrush to apply glue around the snow, pushing glue into the little nooks and crannies at the base of the chimney. 2. With a flat paintbrush, evenly cover each side of the chimney with glue. 3. Hold the house over your wax paper/box. Shake ultrafine glitter over each side of the chimney. 4. Shake excess glitter into the box. Back and Front Roof: Same process… just over a bigger surface! 1. 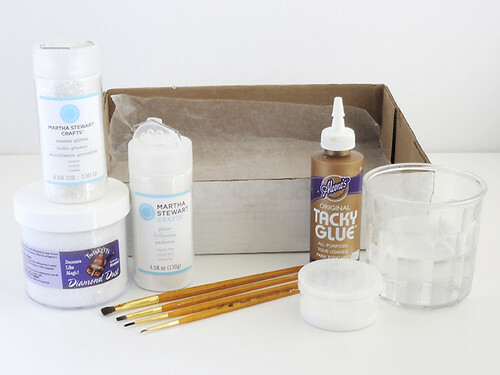 Use the pointed tip of a small round paintbrush to smoosh glue into all the nooks and crannies around the snow. 2. 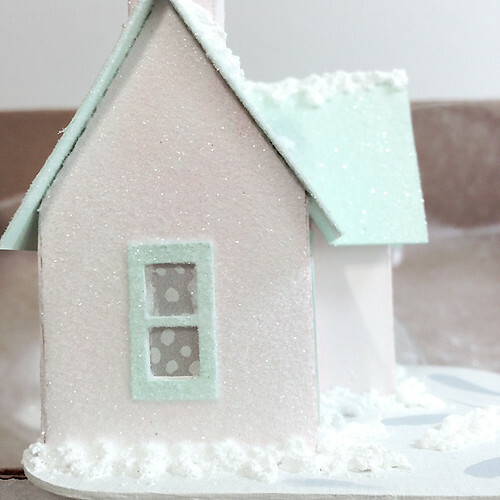 Use a medium flat paintbrush to apply glue along roof edges… be generous! 3. Cover the center area of the roof with glue. 4. Even out glue with long strokes, all the way to the edges. 5. Hold the house over your wax paper/box. 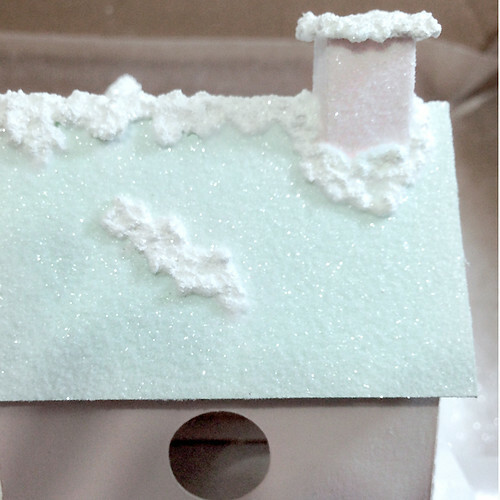 Shake/pour a thick layer of ultrafine glitter over the roof. 6. Shake excess glitter into the box. Check for missed spots and touch up if needed. House: You’ve got this! Glitter one side of the house at a time using the same process! 1. Remember to cover the eaves (underside of roof overhang). 2. Be generous with glue and work quickly to cover these larger areas. 3. Carefully apply glue to the corners/edges. 4. Smooth glue with long strokes. 5. Use a small round brush to apply glue to window/door trim. 6. Let the glittered house dry for 1-2 hours before handling. 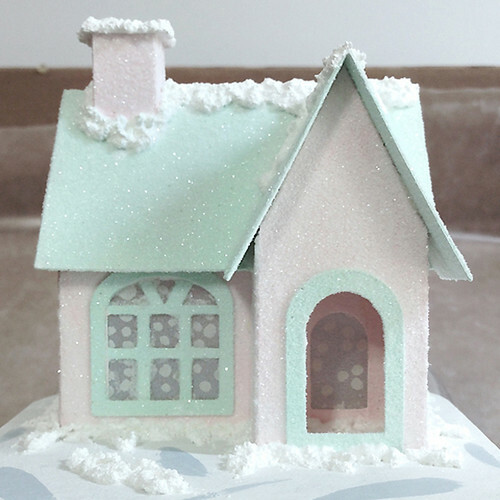 Base snow: Now it's time for the larger vintage style glitter to cover the snow and ornament base. 1. 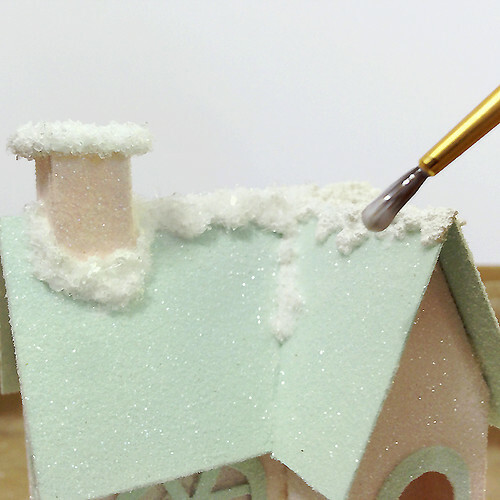 Working in 1-2 inch area at a time, use a small round paintbrush to apply glue to the snow along the roof and chimney. 2. Cover snow with a generous amount of the larger Diamond Dust or Martha Stewart Coarse Glitter. 3. 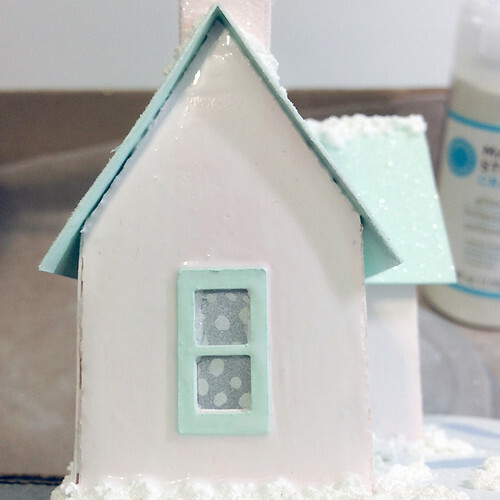 Use a medium flat paintbrush to apply a generous coat of glue to the snow around the house and the entire top of the ornament base. Sprinkle with larger glitter. Let dry. 4. Glitter bottom side of ornament base. Let dry. Your Putz House Ornament is all glittered and ready to adorn with bottle brush trees, a wreath, tinsel twine, and ribbon! 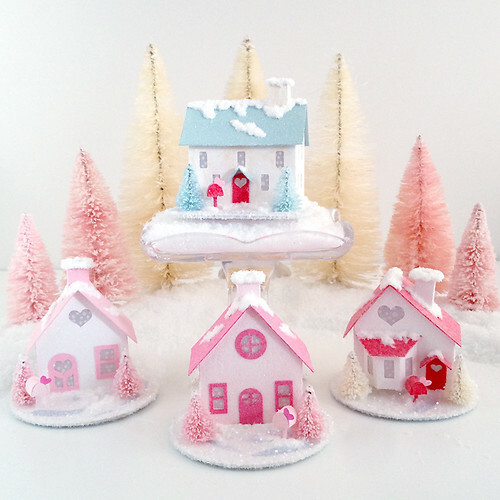 Visit Holiday Spirits to see many more ideas for decorating a variety of putz houses for Christmas and Valentine's Day. Carol is on Instagram too - HolidaySpiritsDecor - where she is celebrating 1000 Etsy sales with a very nice giveaway that is open until 12:00 AM Friday, August 14, 2015. 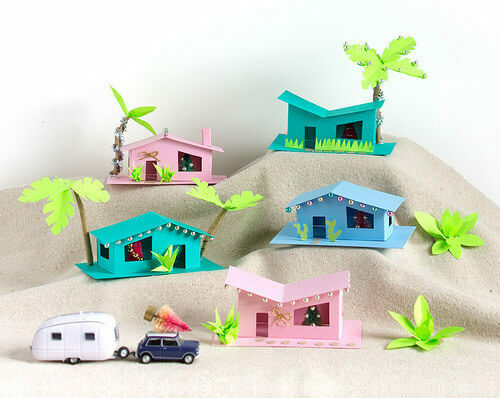 If classic putz houses aren't your style, make a batch of these DIY mid-century ranch houses via Casey of Vitamini Modern and trade the palm trees for some frosty snow! Great decorating ideas! I think the polkadots on the windows are my favorite little detail. I'm so glad you enjoyed the post, Casey. I love your wonderful retro houses too! I'm glad you like them Cecelia! Ahh, just love these. Thank you for the tutorial! I'm glad; thanks for commenting Sue! Really tempting!! Must have been so much fun making and glittering the house. I think so too, Suganthi! I'm glad you like them, Pily! Thanks Maria, that's so nice of you! What a cute idea! Something that might be nice to give some of my removals clients over the festive season! Haha! Thanks for the idea! Wow your glitter house looks stunning as expected! It almost looks like an edible cake top if I hadn’t followed the instructions from the very beginning. This project would be a great activity to get all the children involved so they can create an artpiece while having fun. Great Post! I am making glitter putz Houses and this is helpful! Hi Elizabeth, thanks for stopping by! Would love to see your houses when they're ready. Where can I buy the miniatures and embellishments? 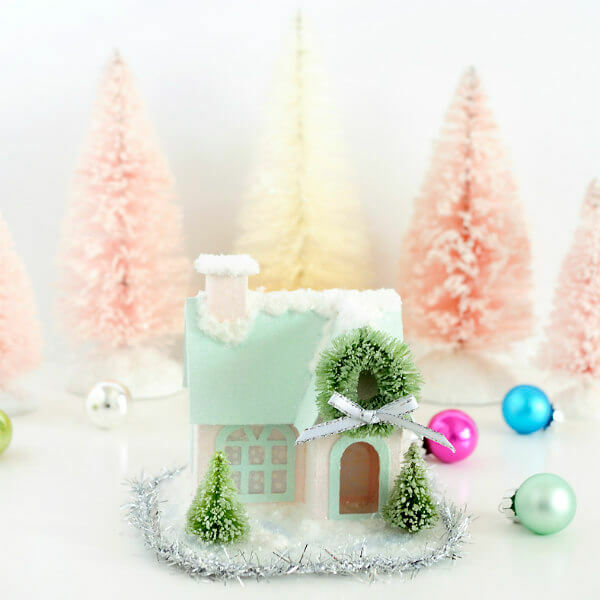 Hi Jodism, the house kits can be found in Etsy shop Holiday Spirits and I've linked the supplies, like the glitter, snow, glue, etc., to Amazon... just click on the blue links in the post.